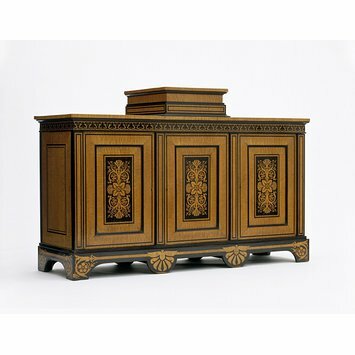 This cabinet is in the Greek Revival style and one of a number of surviving examples of this form. The moulded top and heavy plinth are typical of furniture by George Bullock (born 1782 or 1783, died 1818). Inside, the cabinet is fitted with shallow drawers, intended for coins, medals or natural history specimens. The central raised section on the top was designed for a piece of sculpture or other decorative object. Exotic woods such as maple and ebony were fashionable in the Regency period, but it is unusual to find them combined in this way. The contrast of dark inlay against a lighter ground is typical of Bullock's strikingly individual style. One of his innovations was the use of flat pattern, particularly inlay and marquetry, instead of the three-dimensional gilt-bronze or giltwood mounts favoured by his contemporaries. He repeated the marquetry patterns for the doors on other cabinets, including an elaborate larch and ebony version in the Fitzwilliam Museum, Cambridge. The design for the marquetry is among a collection of tracings that were originally bound in a scrapbook inscribed Tracings by Thomas Wilkinson from the designs of the late Mr George Bullock 1820, which is now at Birmingham Museum and Art Gallery. Thomas Wilkinson may have worked for Bullock, which would explain his access to the original designs. The popularity of Bullock's designs meant that his work was widely imitated and it is possible that the tracings were used for this purpose. This three door cabinet is constructed of mahogany, pine and oak, veneered with ebony and maple and decorated with marquetry of maple on an ebony ground. There is a square pedestal in the centre on the top. Each of the doors conceals ten shallow drawers for specimens. The Greek Revival decoration is concentrated upon the door panels, the frieze and the base. The cabinet is neither signed nor labelled, and it is without provenance; but stylistic evidence strongly favours an attribution to George Bullock. Several cabinets associated with Bullock are decorated with the same pattern on the door panels and further details are given in Clive Wainwright ed., George Bullock, Cabinet-maker, 1988, pp. 65-66, cat. no. 4 and fig. 24, pp. 104-5, cat. nos. 40-1. The cabinet is also typical of his furniture with its moulded top and heavy plinth. Although not immediately apparent from the exterior the three cupboards inside the cabinet are fitted with shallow drawers, designed for collections of coins, medals or natural history specimens. The central raised section on the top was presumably intended for a piece of sculpture or other decorative object. Designs for the marquetry patterns on the frieze, the door panels and the plinth of this cabinet are among the Wilkinson Tracings, a collection of designs on tracing paper formely in an album, in Birmingham City Art Gallery. The pattern for the frieze is dated 18th March 1816 (unbound number 151) and that for the door panels is dated August 1816 (unbound number 240). Another cabinet, also in maple, ebony and mahogany, of almost identical design, was sold Sothebys, London, 30th November 2001, lot. 102. This example had première-partie inlay along the frieze and première-partie inlay in the door panels, whereas the Museum's cabinet has première-partie inlay along the frieze and première-partie inlay in the door panels. Historical significance: For this handsome cabinet, George Bullock used maple and ebony veneers, a very unusual combination of woods for Regency furniture. The dramatic contrast of dark inlay on a lighter ground is typical of his idiosyncratic work, as is the architectural form of the cabinet. This cabinet is one of a number of surviving examples of this form. The cabinet is in the Greek Revival style, the most fashionable for Regency furniture, as shown by its overall design and by the use of anthemia and other Classical motifs. One of Bullock's innovations was the use of flat pattern, particularly inlay and marquetry, instead of the three-dimensional gilt-bronze or giltwood mounts favoured by his contemporaries. Thsi did not necessarily represent an economic decision to avoid costly mounts, but instead can be attributed to Bullock's desire to experiment with marquetry, which had fallen out of fashion in the last decade of the 18th century. 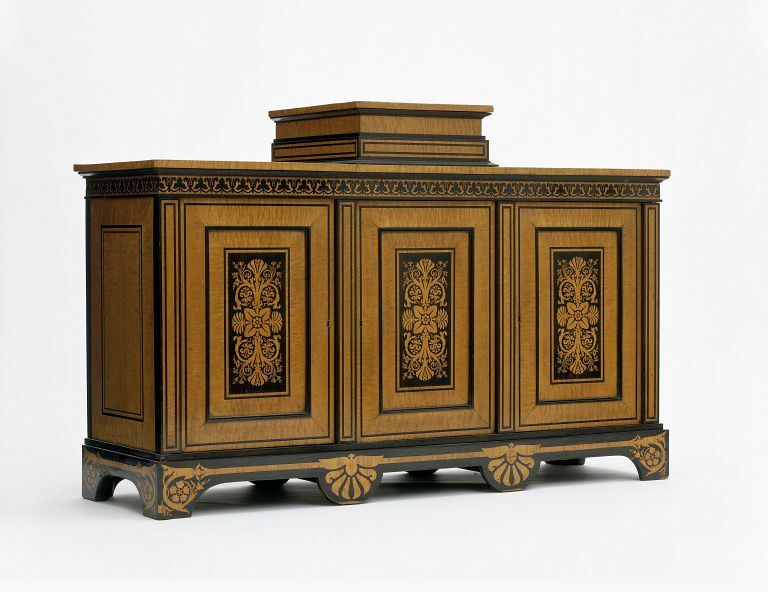 The subtle effects he achieved can be seen in the decoration of the frieze, doors and plinth of this cabinet. He repeated the marquetry design for the doors on other cabinets, notably a grand version in ebony on a brass ground (Fitzwilliam Museum, Cambridge) and a smaller cabinet in maple and oak with ebony inlay (private collection). The design for the marquetry is among a collection of tracings, originally bound in a scrapbook inscribed 'Tracings by Thomas Wilkinson from the designs of the late Mr. George Bullock 1820' (Birmingham Museum and Art Gallery, unbound no.240). Three door cabinet in the Greek Revival style, veneered with maple and ebony. It has a square pedestal on top and contains thirty specimen drawers. British (London), circa 1817. Designed by George Bullock and made by his workshop. Wilk, Christopher, ed. Western Furniture: 1350 to the Present Day in the Victoria and Albert Museum London. London: Philip Wilson Publishers in association with the Victoria and Albert Museum, 1996. pp.142-143. Interior fitted with shallow display drawers. 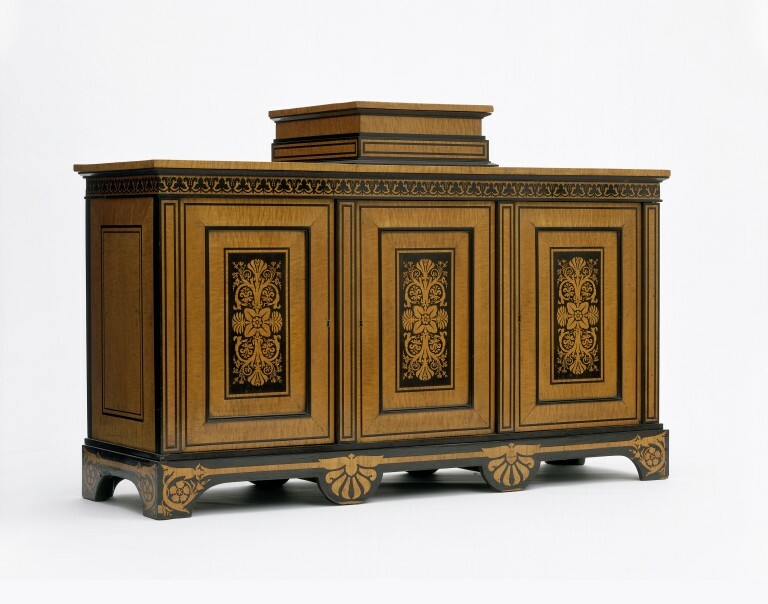 This cabinet is typical of Bullock's furniture with its marquetry patterns, moulded top and heavy plinth. It is fitted with shallow drawers, probably intended for coins, medals or natural history specimens, and the central raised section may have been intended for a sculpture or other decorative object. Stylistic evidence strongly favours the attribution to George Bullock.